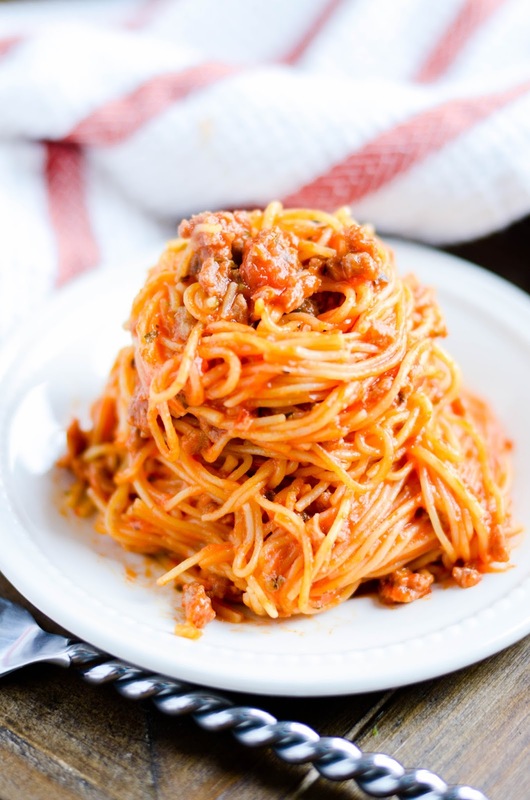 This instant pot spaghetti comes together quickly in one pot, from browning FROZEN ground meat to boiling the noodles. A great weeknight dinner recipe to keep in your back pocket! The feature that I love more than anything in this appliance is it's ability to quickly cook frozen meat. I never, ever, ever remember to thaw out meat before it's time to start making dinner. Never. When I heard that I could cook frozen meat in this thing in a matter of minutes?? I was sold on the spot! 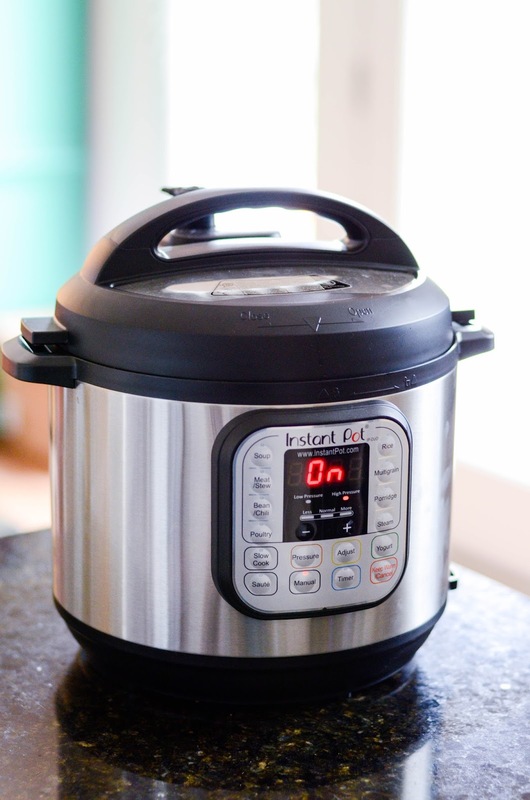 Having made spaghetti in a slow cooker before, I figured I could do that in my Instant Pot as well. But could I brown frozen ground turkey (3 lbs!) and cook my spaghetti in the same pot in less than an hour, dirtying only one pot, and without having to hands-on cook it myself? As it turns out... absolutely. I'd say this ended up taking about 45 minutes in the pot, more or less. And it really only required 5-10 minutes of hands-on time, which was amazing. While dinner cooked, I did all the chores I was supposed to have done earlier in the day... with my husband none the wiser when he walked in the door to find a clean house and cooked dinner 😜. Ah, the magic of modern conveniences! Place the steam rack insert inside the IP. Place the meat on top of the steam rack, pour 1 cup of your liquid over it, and use the manual setting to cook for 25 minutes (if using fresh meat, you could cook for 12-15 minutes). Let steam release. Carefully remove the steam rack, with the meat on it, and set aside. Drain the liquid inside of the IP. Replace the meat and use a spoon or spatula to break it up. If the meat didn't brown all the way through, simply change the setting to sautee and finish browning the meat. Add the remaining liquid (water or broth), brown sugar, and tomato sauce. Stir well before adding the noodles. Make sure the noodles are covered by the liquid. Replace the lid and use the manual setting to cook for 10 minutes. 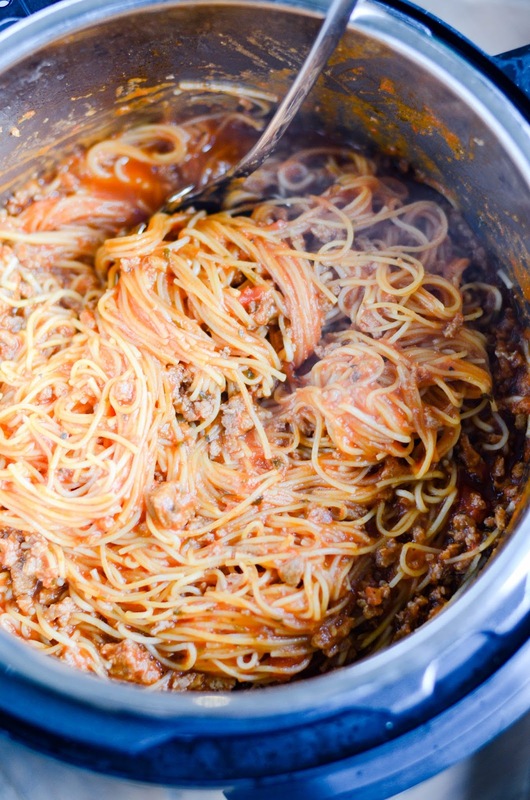 Let steam release before removing the lid and stirring the spaghetti. You can serve it immediately or keep it on the 'warm' setting until ready to eat. Hi - you say 'steam release'. Is that Natural Pressure Release or Quick Release? Thx! I used quick release. 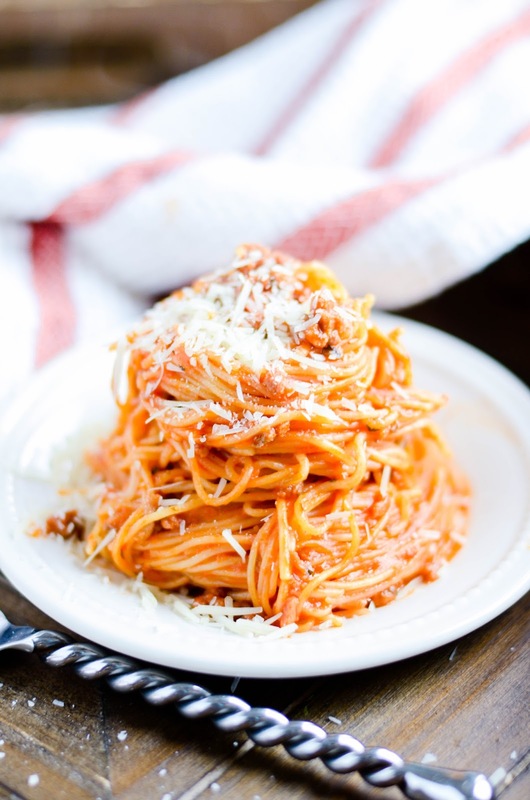 One pot spaghetti recipe is great! Greetings from Los angeles! I’m bored to tears at work so I decided to check out your website on my iphone during lunch break. I enjoy the knowledge you provide here and can’t wait to take a look when I get home. I’m surprised at how fast your blog loaded on my phone .. I’m not even using WIFI, just 3G .. Anyhow, amazing blog! If I WANTED TO ADD VEGGIES (PARTICULARLY BELL PEPPERS, ONIONS, GARLIC) WHEN AND I would I do so??? This was great! My two little boys had seconds, and so did I! I will definitely make it again! Thank you! !